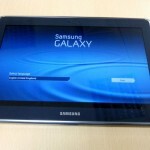 For those of you who are using this device, follow the tutorial below to root Galaxy Note 10.1 N8000. The tutorial employs the use of CF-Auto-Root file which was released by the famous XDA developers. That’s the file that allows the device to root. You will need the correct USB drivers before you begin. Moreover, please ensure that you have the USB debugging mode on and you have at least 50% battery. It is also imperative that you backup your data in case of any losses. To be able to root Galaxy Note 10.1 should be factory unlocked. The following method will only work for this device. If you are ready, please follow the step-by-step tutorial after the break.